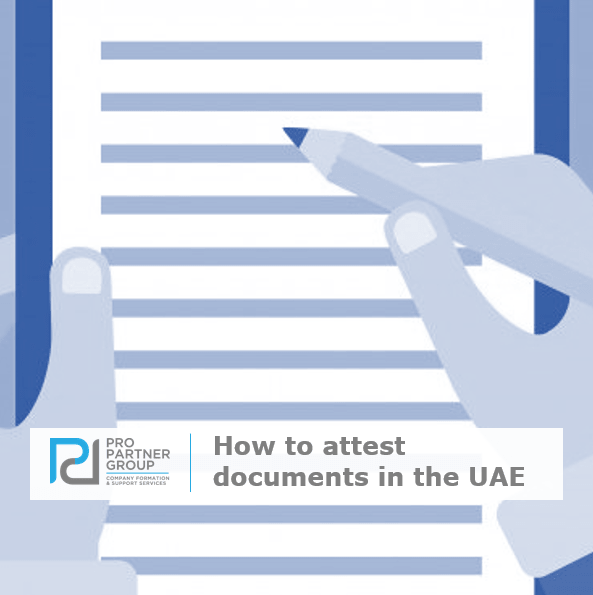 It is essential to have certain documents attested in order to obtain official recognition of these documents within the UAE. Attested documents are required for example for Local UAE Company and Branch formation and registration, visa and work permit applications, family visas, school admissions and specific technical and skilled job roles within the UAE. The process required can vary, depending on the country in which the documents were issued, and sometimes even the document itself. In this article, PRO Partner Group (PPG) Director James Swallow explains how getting it right first time when attesting documents for use in the UAE can save companies time and money, and outlines the procedure that should be followed to ensure the process is as straightforward as possible. Attestation is the process during which the authenticity of a document is checked and verified as genuine. Although it is an essential part of most official Government procedures and applications, it can also be a time consuming and daunting task. Making a mistake can lead to delays in company formation and individual visa processing, which can be costly for both individuals and businesses, and therefore it is important to get it right first time. It is important that documents are attested, as employers and government bodies are not able to know whether or not a document issued in a foreign country is genuine. This is particularly important for educational certificates, which will vary in appearance from country to country. It therefore provides reassurance to all parties that a potential employee’s qualification or marital status is exactly as claimed. Before starting the attestation process it is important to check that the correct documents have been obtained, as this will vary depending on the application. It is also necessary to prepare a clear colour photocopy of each document in addition to the original, and if the document is written in a language other than Arabic it may need to be translated. It may be advisable to consult with a professional attestation service before proceeding further, in order to avoid any issues once the documents have been sent off for processing. All documents which were issued outside of the UAE need to be verified within the country of origin, so for example, a degree or diploma certificate from a UK university must be sent to the UK for attestation. The document is viewed by a notary in the country of origin who produces a ‘true copy’ stating that they have seen the original and that the documents stamped is a true copy of the original. This notarised true copy is then brought to the Ministry of Foreign Affairs in the country of origin who will ‘attest’ that the Notary stamp is genuine. This notarised and attested document is then taken to the UAE Embassy in the country of origin who will stamp (legalise) to say that the Ministry of Foreign Affairs stamp is genuine and it can be used in the UAE. The document can then be posted to us and we will then obtain the UAE Ministry of Foreign Affairs (MOFA) stamp which will verify that the UAE Embassy in the country of origin in genuine. Generally speaking UAE MOFA stamps for personal documents such as Degree certificates cost AED 150 per document. Corporate Documents such as Certificates of Incorporation cost AED 2000 per document to stamp at MOFA in UAE. PPG can assist to obtain these stamp for you. The document can then be legally translated into Arabic and stamped by the Ministry of Justice to say that the translator is legally appointed. PPG can assist to coordinate the legal translation. The document is then fully ready for use in the UAE. Other fees will apply at each stage and are subject to change. Using a professional attestation service from the UAE can take away much of the stress of ensuring that all the requirements are met for attestation, and reduces the risk of costly delays or errors. PRO Partner Group can assist to offer a door-to-door attestation service for legalisation of overseas documents, both in the United Kingdom and across Europe and the world through our network of trusted partners.